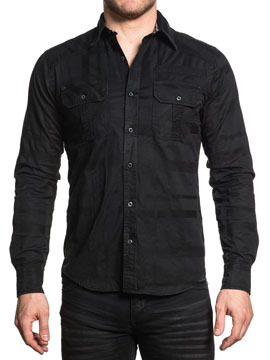 Affliction Black Premium Undertake mens long sleeve button up woven shirt features two chest pockets accented with Affliction logo above one pocket. The back features Affliction BLK PRM logo with a large image of medieval shield, fleur, eagle coat of arms embellished with dome metal studs in the center. Lava wash for vintage look. 100% Cotton. slim fit, custom buttons, stitching and seams. Color: black.